The new site is LIVE. Hey y’all. Me again, the self-proclaimed “Chief Marketing Officier,” Kori. Sooooo…. it’s taken me what feels like FOR-EV-ERRRR to get the new site up and running. You could say I waited a while for mom and dad (those MVPs I previously mentioned) to send me pictures. But in reality, I had no clue what I was doing. What’s even more embarrassing is I just got a new position with my current company as the Associate Product Manager of ALL COMPANY WEBSITES. No pressure. So after many long nights of breaking things in WordPress, I did it. I managed to build CCK a brand new, and might I say beautiful website. We left the green in there – it’s just not lime-colored anymore. Don’t ask… my resolution was off… *inserts cry-laughing emoji* But now it’s responsive to whatever device you’re using, has up-to-date pictures of the pups that automatically scroll through, and buttons that actually take you to other pages! Fancy, yes indeed. I know I can be pretty entertaining in person, hopefully these blogs posts translate my hilarity even a little. But if not, let me end with a quick story and pic to go with it. As you may know from reading our (FANCY NEW) site, we primarily raise the pups and dogs in our home (well, my parents house, but inside). So the puppies recently switched to mushy but solid food, instead of milk only. Susy made this decision one day before mentioning it to Mike. Earlier this same day, Mike gave all of the pups a bath, trimmed their nails, and got stuff ready to take adorable updated pictures when he got home from work. Later that night, Mike comes home and just smells poo. Unfortunate, yes. That’s the point where they go to the kennels typically, but surprise! Every. puppy. covered. in. poo. You guys, they had to rewash all of the puppies, clean up their pens, then go prep the kennel for the transition. All after getting home from work and before doing anything for themselves. I don’t know when they find time to feed themselves sometimes! No wonder I’m usually waiting on pictures. 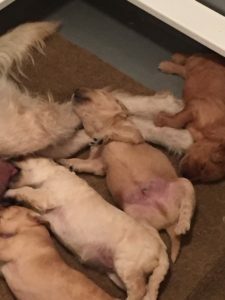 So in honor of this transition from milk to mush, and little puppy poos to actual poo, here’s a reminiscent of the “good old days” when the puppies just ate until all they could do was sleep and the mamas cleaned up after them. #MilkDrunk! cricketcreek on We have puppies! Janice Hill on We have puppies!